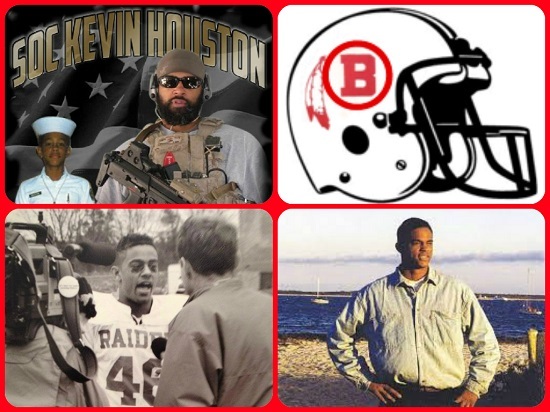 Navy SEAL SOC Kevin Houston, Barnstable’s own national hero who was killed in Wardak Province, Afghanistan on August 6, 2011, received the honor of being the one and only Barnstable Red Raider athlete in any sport to date to have his number retired. The Number Retirement Ceremony was held this morning before the 88th Annual Thanksgiving Day game. 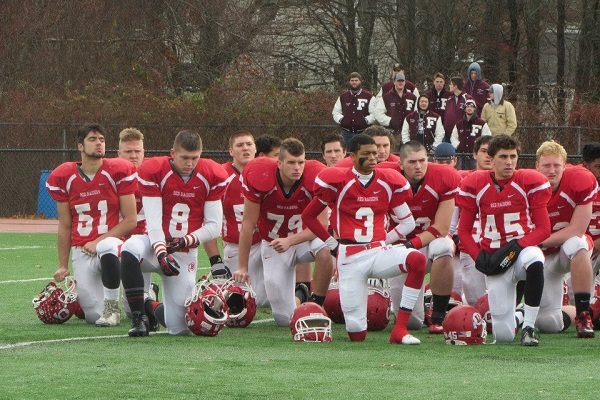 Barnstable defeated Falmouth 34 to 27. The following pictures of the Number Retirement Ceremony are provided courtesy of State Representative Brian Mannal and his wife Sara, both on hand to honor SOC Kevin Houston’s memory. The pictures are followed by a beautiful poem of thanksgiving composed by Janette Anderson, Gold Star Mother of Navy Seal SOC Kevin Houston. Friends, family, and Red Raiders standing beside Kevin Houston’s retired jersey. 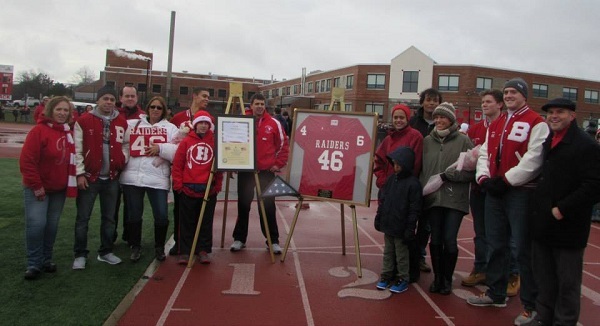 With pride, respect and honor, BHS Red Raiders take a knee during the ceremony to retire Kevin Houston’s high school jersey #46. State Representative Brian Mannal speaks in honor of Kevin Houston. As children, the two men were teammates with the Barnstable Silver Bullets. Kevin Houston’s former teammate and best friend Joe Kennedy formally announces the retirement of #46. Kevin Houston’s mother, Jan Anderson, hugs Quarterback Club President John Hardy after being presented with the actual jersey that her son wore as a Barnstable Red Raider. 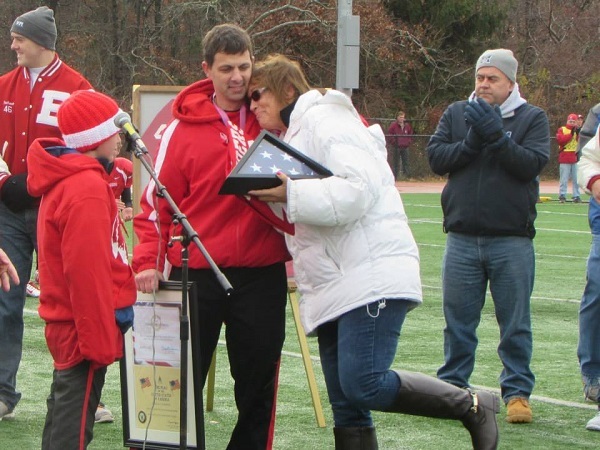 She also holds a flag gifted by the United States Senate through Senator Elizabeth Warren to honor her son. The flag was flown over the United States Congress building. 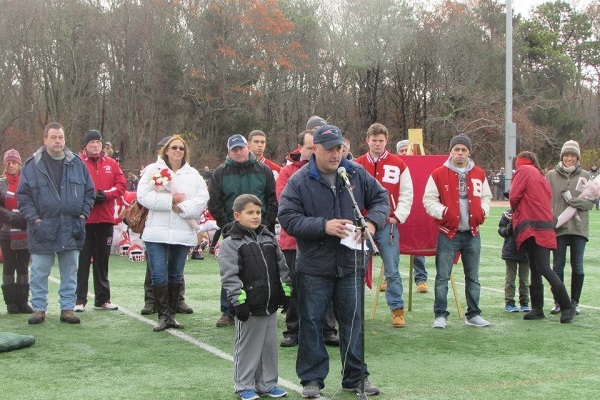 Kevin’s Houston’s BHS Red Raider Head Football Coach, Paul “Spanky” Demanche, stands applauding in the background. 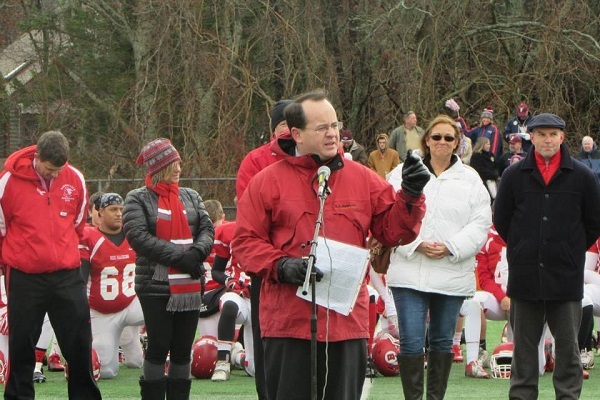 Jan Anderson graciously thanks Barnstable High School, the Barnstable Quarterback Club, and others for retiring her son’s jersey on Thanksgiving Day. 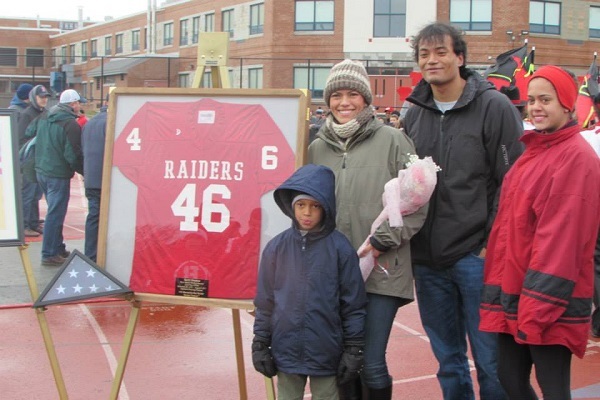 Kevin Houston’s wife, Meiling, and their three children stand proudly beside his retired #46 jersey that will be displayed prominently at Barnstable High School. 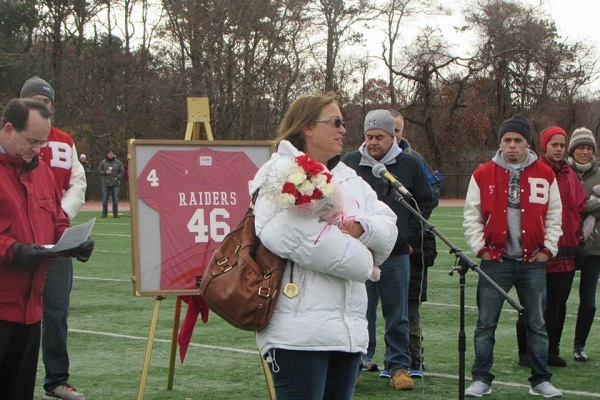 In honor of her late husband’s heroism, Meiling was presented with a #46 jersey and flowers at the ceremony. 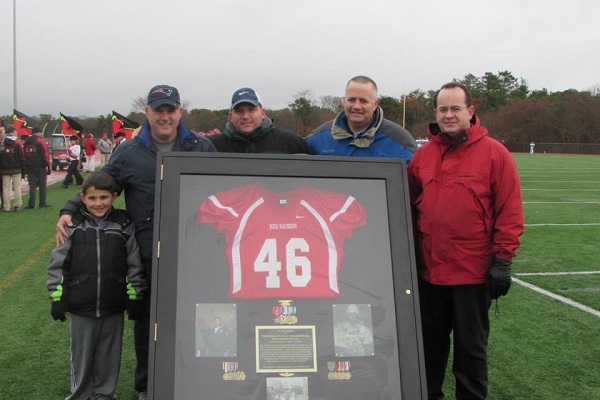 Joe Kennedy, Jasen O’Neil, Justin Cazeault and Brian Mannal stand beside an amazing shadow box created by Joe Kennedy to house Kevin Houston’s retired jersey. To the hours of practice and coaches rants! And getting off Cape in a hurry and rush! To the years of cheering til I lost my voice…hey, the kid was good; I had no choice! Hungry, filthy and exhausted to the bone. Silver Bullet Saturdays were the best! BHS Fridays were better than ALL the rest! Are DEFINITELY moments that I hold VERY dear. Thank you QBC-you all rock! Thank you Hall of Fame committee-a tremendous honor!